Performers include: Danny McBride, Walton Goggins, Kimberly Hebert Gregory, Georgia King, Busy Philipps, Shea Whigham, and Sheaun McKinney. 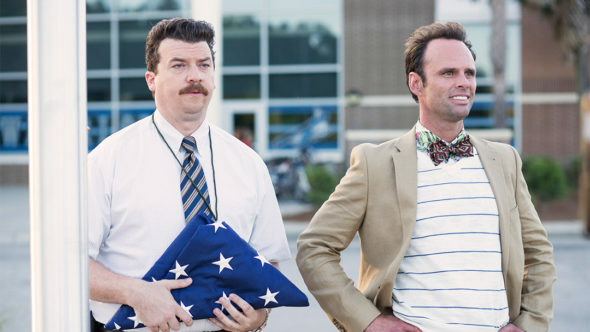 This dark comedy TV show takes place at the North Jackson High School, and revolves around the two people who almost run it — the Vice Principals. The series’ story is told over the course of one school year. Neal Gamby (Danny McBride) is a divorced and angry vice principal who is in charge of discipline at the high school. Meanwhile, Lee Russell (Walton Goggins) is a conniving politician who’s the vice principal of curriculum. They are mortal enemies and are in a power struggle because each wants to take over the job of Principal. The position is vacated by Principal Welles (Bill Murray) and outsider Dr. Belinda Brown (Kimberly Hebert Gregory) is brought in to replace him. This brings Neal and Lee together in an unholy alliance. Other characters include new and naive English teacher Amanda Snodgrass (Georgia King); Neal’s ex-wife Gale (Busy Philipps) and her new husband, laid back Ray Liptrapp (Shea Whigham); and a perceptive cafeteria worker named Dayshawn (Sheaun McKinney). First aired: November 12, 2017. What do you think? Do you like the Vice Principals TV show? Do you think there should have been a third season? At least one extra season funny show, I am an HBO Now subscriber if you guys keep cancelling my favorite shows I might have to cancel my subscription…I haven’t anything about Real Time with Bill Maher. Please Bring it back. Funniest show in a long time!!!! yes- bring on more of this quirky series. It’s just fun! This show is great! HBO needs to put it back on next year! Love this show! This show is awesome. I can’t believe only two seasons. Neil Gamby and Lee Russell – – What a comedy duo – – Danny McBride and Walt Goggins – superior performances. Love the fight scenes. I watched the first season about four times. C’moan – a few more seas0ns – please? My husband and I absolutely love this show!! HBO come on put it back on for a 3rd season!! I love that show. I stumbled upon quite by accident & binge watched it. I am so disappointed that this show will not be around for a third season. How I wish the powers that be would kindly reconsider. Keep this show going HBO, stop being dumb! Love this show! Keep it going!